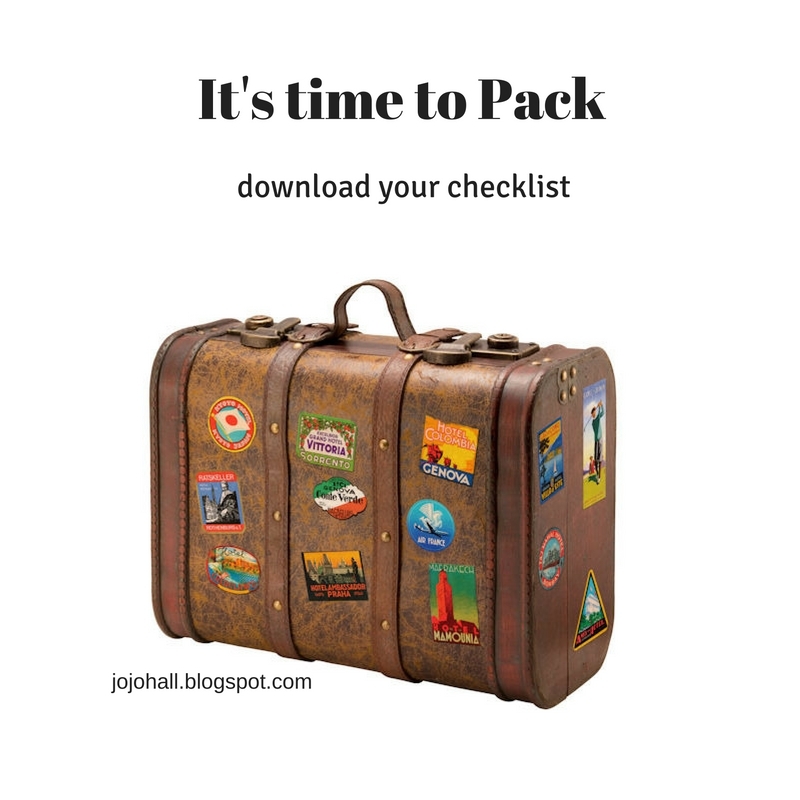 through my hands: It's time to Pack! If you haven't requested your passport yet, you still have time! Don't miss out on the travel adventure of a lifetime. This is a a unique quilting, world-wide travel adventure! I've added a badge to the right of my page for those who have a blog and want their readers and friends to join us. Just copy all of the text in the box and insert into your blog using the html link under design>layout. Those that need their passports, please click HERE to learn more and to sign up. Please sign up on that post not this one. Leave a comment letting me know you need a passport (don't forget to leave your email addy in the comments section. Bonnie Preslar -- I do not have an email for you and cannot send your passport until I hear back from you. If you prefer to not leave your email publicly, email me directly at jojo(at)jojohall(dot)com. Now onto the packing! Getting the PDF to you proved to me more than my pay grade. I hate being stumped so I saved it as a jpg. It is shown below. You don't have to join, just click the download button. 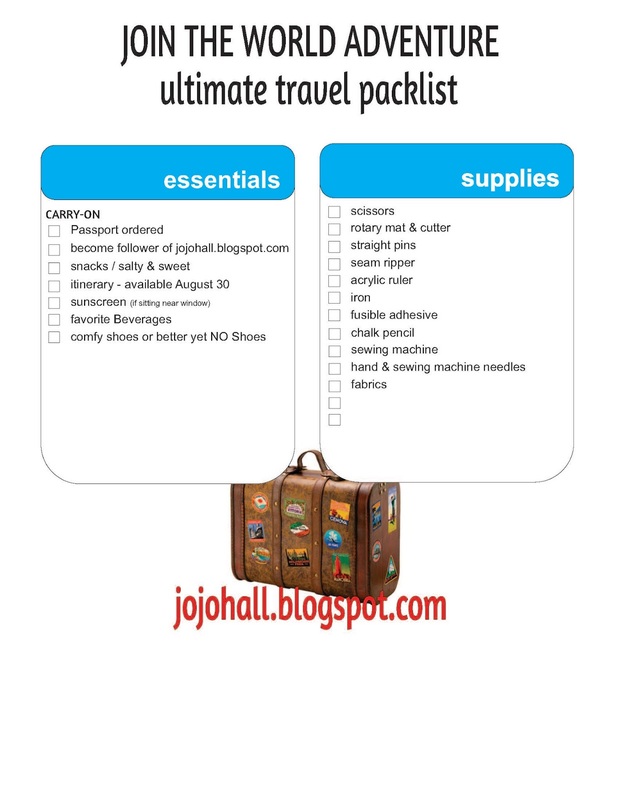 Because our adventure is going to take us to a lot of places and we can't possibly pack enough to get us through the entire trip, I am going to start off with the basic items that you will need and then I'll let you know additional items that you can pick up as we travel. Everybody loves shopping while they're traveling, right! You really need only basic general sewing supplies. We'll talk about additional supplies that you might want to purchase as we continue our journey. We are starting off in my home state of Oregon. It's way too hot here right now so I'm hoping cooler weather will head our way by September. If you haven't seen our destinations, click HERE to see where we are heading. I've been really busy writing instructions for September's souvenir and can't wait for our journey to begin. The file for the packing list is set to private.....so I could not get it. Does that mean you will be sending it separately to those of us that have a passport? I could not open the file either. It opened a preview in Scribd but said I could only set up an account for free for one month. What am I doing wrong? Hmmm...let me recheck the settings. Sorry. Back soon. Sorry about the problem with downloading. I located another site that allowed public viewing with the world and doesn't make everyone have to join yet one more site.